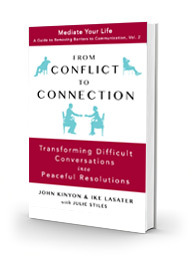 From Conflict To Connection:Transforming Difficult Conversations into Peaceful Resolutions is the latest in the Mediate Your Life series, A Guide to Removing Barriers to Communication. From Conflict to Connection is available for purchase at Amazon in paperback and e-book form. Everyone experiences conflict, and if you’re like most people, it is typically a source of stress or even strife, within relationships. But what if you could have difficult conversations with ease and create agreements that actually work? If you’re ready to escape the power struggle of relationships, be able to hear the other person and express what you’d like to say, and find solutions that work for everyone, From Conflict to Connectionprovides a new way forward that has transformed the lives of people worldwide. Searching for a practice partner? The Mediate Your Life Practice Partner Facebook group is a private, closed forum in which people can connect with others across the globe looking for practice partners with whom they can work on Mediate Your Life skills. If you are seeking a practice partner click on “Write Post” and enter (1) what you want to practice, (2) and, the times you available to practice, and (3) the language you want to use We welcome you to write your post in that language). Remember to indicate your time zone. If you read a post that you are interested in, enter a comment on that post. We suggest that you do not post your contact information on this group wall, but rather communicate with your potential practice partner via Facebook Message/Messenger.